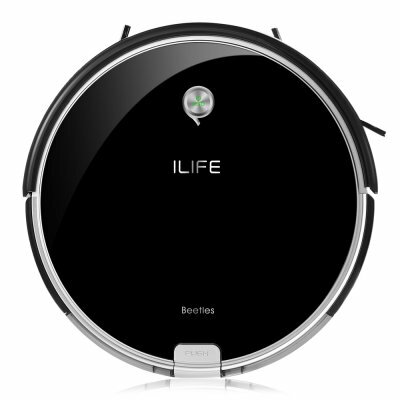 Successfully Added ILIFE A6 Smart Robotic Vacuum Cleaner Anti-Drop Remote Control Automatic Recharging 2500mAh Black (EU Standard) to your Shopping Cart. Gen 2 CyclonePower 3-stage system, the advanced spinning side brush pushes the debris into the path to catch dirt and dust hiding along the walls. BladeAway spiral tangle-free rubber brush, it solves the toughest issue caused by tangled brush. The powerful motor offers up to 1000Pa suction to absorb the debris from all types of floor. Never get trapped, it adapts to the environment for thorough coverage, and can adjust its head to prevent getting cornered. ILIFE Intelligent Robotic Vacuum Cleaner is an essential household cleaning machine. The Gen 2 CyclonePower 3-stage System, which is the combination of agitation, brushing, and suction delivers the through and complete cleaning performance. The BladeAway spiral Rubber Brush combining with our Tangle Free Technology extracts dirt efficiently and solves the toughest issue caused by tangled brush that most robot vacuums faced. A full suite of Intelligent Sensors beneath the robot allow ILIFE robot cleaner to work its way around furniture and avoid stairs or other dangerous drop-offs. 8cm Ultra-thin Body with its super adaptive capacity makes it shuttle back and forth under furnitures like beds and sofas without getting trapped. The 160min working time with 2500mAh powerful Li-ion the battery is specially designed for the large home. The Universal Wheel under the dust box effectively reducing the friction between the robot and the floor, improves the cleaning performance for carpet and hard floor. Start your new day without heavy housework and clean your floor every day all at a push of the button! It can effectively reduce the friction between the robot and the floor, which improves the cleaning performance for carpet and hard floor. Auto cleaning, spot cleaning, max mode, edge cleaning, mini-room cleaning. Simply make an appointment and go to work, the robot will start to work at a specific time. The large wheels are specially designed to work on the rough floor. It can also steadily climb 15-degree slope. The embedded anti-drop sensor can detect the location and change the direction in order to avoid falling. When the power is about to run out, the robot will go back to the charging base. It creates an invisible barrier that A6 will not cross. You can control the direction, choose the cleaning mode and make an appointment with the remote controller. The maximum climbing angle is 15 degree. The 8cm slim body is designed to clean the areas under furniture that you cannot reach. The tempered glass top cover with the black finish, it looks elegant and graceful. Built-in 2500mAh Li-ion battery, the charging time is less than 300min, the usage time is up to 160min. Applicable to the wood floor, rubber floor, tile etc.